Did you know that by examining the performance of NYMEX Light Crude, you can predict within less than 1% the precise closing prices of Brent Crude on the IPE exchange about 99% of the time? It's simple: You just take the open, high, low, and close of any given contract of the NYMEX market and add in the prior day's closing price spread (currently about $1.14 per barrel). The result will be the value of the IPE market statistics within about 1%. That $1.14 constant applies to the current-day differential as of the time of writing. As the price of crude rises, the exact differential will rise slightly, but the idea is that you don't need to subscribe to the statistics of the IPE to know what will go on there each and every day. Incidentally, both markets trade simultaneous coincident hours and both are quoted in dollars. The $1.14 differential has to do with points of delivery and other contract details which depend upon respective price levels. If you are paying the IPE fee in excess of $9,000 per year to enjoy the privilege of a Sub Vendor, you may be wasting your money. Don't pay it; compute it! And save money in the process. 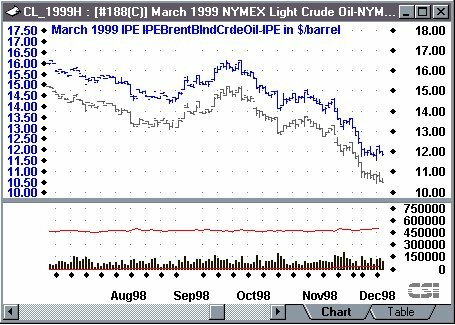 The chart of March 1999 Light Crude and Brent Crude show the remarkably similar images of the two contracts from both exchanges. There may be arbitrage opportunities intraday between these two markets, but they must be noticeably insignificant. As we said in last month's edition of the CSI Technical Journal, there could be a problem for users who depend upon the MetaStock format through and beyond the year 2000. It is our belief that MetaStock does not plan to make it simple for users of their format to reach beyond the end of 1999. One source told me that they would not attempt to encrypt or encode their format, but that they would not necessarily be willing helpers in the conversion process. I'm also told that MetaStock may not yet know what their new format will look like. We certainly hope that MetaStock and Reuters will be open about their new format changes. Keeping format details secret for a publicly offered product like MetaStock is tantamount to Microsoft® keeping their Windows architecture secret so that the non-Microsoft browser market couldn't be accessed through a Windows interface. In case the worst occurs, to get around the problem of not knowing MetaStock's new format, we at CSI have extended the old CompuTrac/MetaStock format that current users read and use to process their data into what we will be identifying as the CSI Millenium or CSIM format. This format will work with both QuickTrieve and Unfair Advantage through the 21st century and for periods back into the 1800s. The details of this format have been posted on our web site for our users and in hopes that MetaStock might want to make their software compliant. The new CSIM format may very well become a more popular format than the one MetaStock plans to move into. This is true for the simple reason that we are not the least bit afraid to be open about how to write programs for it. At CSI, we earn our business based upon excellence in data accuracy, world database scope, and timely delivery; Not upon a secret format that may keep customers loyal for all the wrong reasons. In fact, we encourage all of our competitors and other data firms to use the CSIM format. We have asked MetaStock for details on their new format, and perhaps they will eventually comply. MetaStock has told CSI in the past that we are considered some form of a competitor. This may have been disputable in the past, but now that MetaStock is owned by the giant known as Reuters, their assertion may be closer to the truth. Every year about this time, traders thumb through S&C's trademark publication (sent out in mid January) to see which firms are honored for their contributions in areas of data, software and finance. Each year I cringe at the results, which somehow elevate seemingly undeserving firms to the top of the list. After the awards, you will inevitably see the winners touting their achievement through advertisements. What's wrong with this picture? Let's start with the award itself. The problem has to do with the implication of the word "choice." Webster's dictionary defines choice as "the act of selecting from among two or more things, that which is preferred." Technically, S&C worded their ballot properly, but they failed to disclose the subtle forces that will discredit the results. Chief among the design flaws is the fact that the ballot is incomplete. Although readers might assume that all products and services within a category are fairly presented on the ballots, this is not the case. When you see S&C's survey results, you may notice that in spite of our advertising presence in the magazine since they began printing back in 1979, they have left CSI out of the category, "Data-Historical." They also left CSI's Unfair Advantage® out of the category, "Software-Data Download." It is pretty much a given that we will not win in those areas, where our only possibility lies with write-in entries. Another flaw we see in the process has to do with undisclosed inter-company alliances. Although not widely known, it is a common practice for software firms to remove choice altogether with regard to the corresponding services their software supports. The software of some visible firms works with just a few data firms who will kick back 50% (more or less) of their data collection revenue. Because marketing expenses are quite high, both parties can argue that the kickback is merely a marketing fee. Although there is really nothing wrong with this practice, it places behind-the-scenes influences on Reader's Choice balloting and vastly distorts the accuracy of the survey. Kickbacks apparently are the norm, but if a firm is viewed as a possible competitor (as Omega and MetaStock consider CSI), then that firm would not be a published option for data. In many cases, when subscribers fill in their ballots, they are simply identifying the companies their software developer recommended. The "Choice" in S&C's award becomes that of the software vendor, not the reader. Omega Research, MetaStock® and Windows On Wall Street® give users a choice when they supply custom downloader software, but none of these firms will include CSI on their menus, even though our data may be cleaner and our fees lower. (WOW said they may at a later date.) Their downloaders typically direct users to Dial Data®, Genesis, Telescan®, and Reuters®. Because these software firms contribute the most business to the End-of-Day data community, CSI. will always receive a minority vote. We are simply unknown to most traders. Omega Research products read the CSI format, however, and through the ASCII, CSI and the MetaStock formats, we are compatible with their products. Fortunately, CSI is both preferred and engaged by many independent-minded traders and by many professional software developers who will not compromise data scope, quality, service and support for their users. To their credit, the editors at Stocks & Commodities Magazine apparently attempted to make it a fair contest. They sent a survey to their subscribers (non-advertisers) asking them to mark their "choice" on a ballot of assorted products and services. However, since the ballot didn't go to the product or service vendors, omissions and misclassifications were not corrected. This critique of S&C's policy is not meant to detract from the deserving winners who, through hard work and product excellence, capture unbiased recognition for their achievements. Many of the companies who gain recognition in S&C's "contest" do so with great merit. Nevertheless, when you see that CSI lost again to the firms promoted by the most popular software vendors, you may better understand the result. If S&C continues with their survey in the year 2000, I predict that they will do a better job with their ballot format and we will finally crawl closer to the top. CSI will be closed for voice communication Friday, January 1st for the New Year's holiday. All exchanges will be closed, but the CSI host computer will be accessible as usual.